It’s that time of year again when the well-known coffee shop chains have brought out their festive drink menus. A particularly popular one seems to be the Black Forest Hot Chocolate from Costa. I have to admit, this is definitely my favourite! So much so that I even made a cake version of it. You can read that recipe HERE if you want to give that a go. Sometimes though, you just don’t want to have to go to Costa for one. You want one in the comfort of your own home, with your PJs on and your feet up watching a film. Well the good news is they are really easy to make. Costa have slightly changed their recipe over the past couple of years. They now use a sour cherry syrup on top. I prefer the version they used to make, and so this recipe is for the older version. You might be surprised to learn that the actual hot chocolate part was flavoured with blackberry syrup, not cherry or Black Forest syrup as you would expect. I did once accidentally make it with cherry, and while it was still gorgeous, it wasn’t as good as it is with blackberry. To get the same wonderful taste that Costa gets, you also need to use the same brand of syrups, Monin. I have been a huge fan of Monin syrups for a long time. They have a huge array of flavours available, but for this recipe you will need just two: Blackberry syrup and Cherry syrup. (I’ll put links up at the end for a great place to buy these at a good price). I make mine using a Tassimo coffee machine and the Cadbury Hot Chocolate pods. If you don’t have a Tassimo machine though you can just use 215 ml of your preferred hot chocolate. (Or look out for a machine in the January sales – they are around £40 at the moment so will probably be even cheaper soon). You can make this in a mug if you want, but I think they look fabulous in a latte glass. You can pick these up really cheaply from most homeware shops or Amazon. My final tip is about the topping. Costa use chocolate curls to decorate theirs. I have done that a few times myself (easily done by scraping a vegetable peeler down the side of a block of chocolate) but we much prefer to just crush up a Cadbury Flake. One full-sized Flake will give you enough chocolate for 3 drinks, or 2 if you like extra hehe. The recipe below makes 1 drink. If using a Tassimo machine – place 1 tbsp blackberry syrup into a latte glass. Follow the easy machine instructions to make the hot chocolate, allowing it to pour straight into the latte glass with the syrup in. Stir well. If not using a Tassimo – make 215 ml of hot chocolate in a latte glass according to the instructions on the brand you are using. Add 1 tbsp blackberry syrup, and stir well. Shake the squirty cream can well and make a big swirl on top of the hot chocolate. Drizzle some cherry syrup over the cream and then top with chocolate curls or Flake. I must warn you though, this drink is very filling so don’t have one before a meal. I buy my Monin syrups from Udal Supplies as they are quick to deliver and priced well. I also find that it helps to have a bottle pourer to make drizzling the syrup easier. If you search for ‘Monin Pourer’ on the website you will see a range of them to buy. (I have the black pourer which costs £1.80). DISCLAIMER: There are no affiliate links in this post and I receive no compensation in any form from Udal Supplies. It is just my preferred place to buy the syrups so I like to recommend good companies. Likewise I recommend Monin for authenticity and quality; I receive no compensation from them either. Valentine’s Day is almost upon us and with it, many people will be planning a romantic evening for their loved ones. What better way to start the celebrations than with a beautiful cocktail? I have to confess, I really love cocktails! The different flavours all blended to perfection to make an even better flavour, the colours, the glassware…. I just love them! They are the perfect way to enhance any celebration. In fact I enjoy them so much I even bought a cocktail shaker set to make them properly! You don’t need one of those though. Any container with a tight fitting lid will do the job just fine. Thermos flask, large screw-top jar… the list is endless. When I think of cocktails, I think of alcohol, fruit juices and Monin syrups. Monin is recognised by many as the market leader in flavoured syrups and has won several international quality awards. Their syrups are used in the hospitality industry, both in cocktails and in hot beverages such as coffee. I personally use them in cocktails, coffee, hot chocolate, and baking, and they never fail to impress me with their flavours. I was recently sent an email telling me about a romantic cocktail created using 2 of their syrups. Obviously I had to try it and all I can say is WOW! Allow me to introduce you to the Queen of Hearts. She is a thing of beauty. Fruity, sweet, delicate but powerful, and with a warming aftertaste which lingers after the last sip has been taken. The Queen of Hearts contains Monin Grenadine syrup, which is a beautiful combination of slightly tart red berries and a hint of a vanilla. This syrup is widely known for its use in a Tequila Sunrise. It has a rich red colour which is perfect for romantic cocktails, with red traditionally being the colour of love and passion. The Queen of Hearts also contains Monin Vanilla syrup, with its warm and comforting properties. The alcohol content in this cocktail comes from white rum. There are many brands to buy but I used Bacardi. It is my rum of choice for drinks where a white rum is needed. So how do you make one? I’ll tell you. Fill a cocktail shaker (or any container with a tight fitting lid) with ice. Add 20ml Monin Grenadine syrup, 20ml Monin Vanilla syrup, 40ml of light/white rum, and 60ml of orange juice. Shake well, and strain the liquid into a cocktail glass. You can serve it like that, but if you want to add a touch of romance, I think cocktail glasses look better rimmed with sugar. You need to do this BEFORE you pour the liquid in to it! Just pour some water on to a plate and place the glass upside down on to the plate. Sprinkle some caster sugar on to another plate and press the glass rim on to the sugar. It will stick perfectly, giving a lovely frosty look. To go one stage further, garnish with a strawberry heart. This is a really simple but oh so pretty garnish. Just slice a strawberry from top to bottom, and you will have a slice which is very similar to a heart shape. You can trim it slightly to make it look even more like a heart. Cut a small slit diagonally upwards near the bottom. Dip into the leftover caster sugar from the glass dipping to coat both sides, then position on to the edge of the glass using the slit you cut. I’m sure you’ll agree that looks so pretty and just says romance! 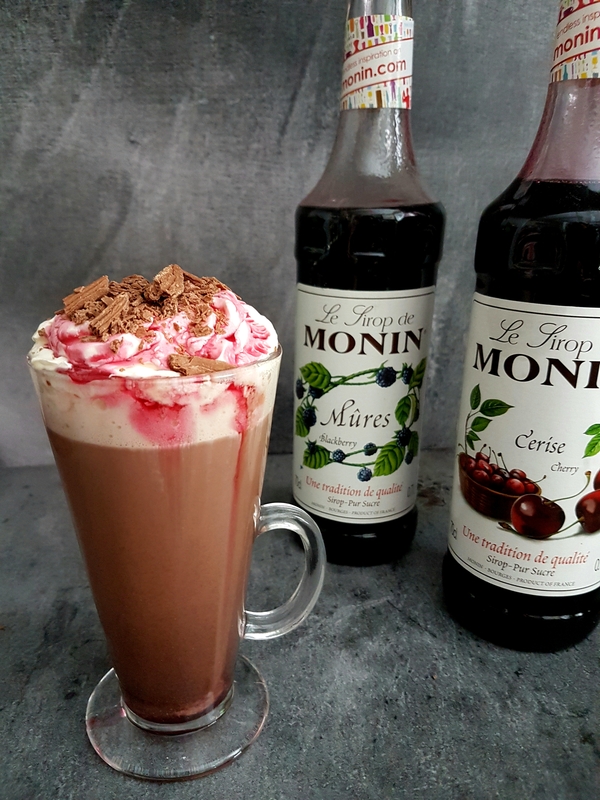 Monin Grenadine syrup is available in the spirits aisle in Sainsbury’s and Waitrose, priced at £2.99 for 250ml. Monin Vanilla syrup is available in the hot beverages aisle in Sainsbury’s, Tesco and Ocado, at the same price. If, like me, you plan on making lots of cocktails, I would recommend buying bigger bottles from UDAL SUPPLIES. This company stocks a massive range of Monin syrups at amazing prices and it is much more economical to buy larger bottles. (This is where I bought mine from too). Delivery is 1-2 days and your bottles arrive packed so securely there is no chance of any breakages. Their customer service is friendly and efficient. Perfect. DISCLAIMER: Monin sent me details of how to make the cocktail (apart from the garnish) but I bought the ingredients myself. I received no compensation in any form for writing this post. Udal Supplies also provided no compensation. I am just happy to recommend good products and services. All views and opinions are my own. With Christmas already becoming a distant memory, thoughts turn to Valentine’s Day. Whether you’re single or in a relationship, you just can’t escape it. 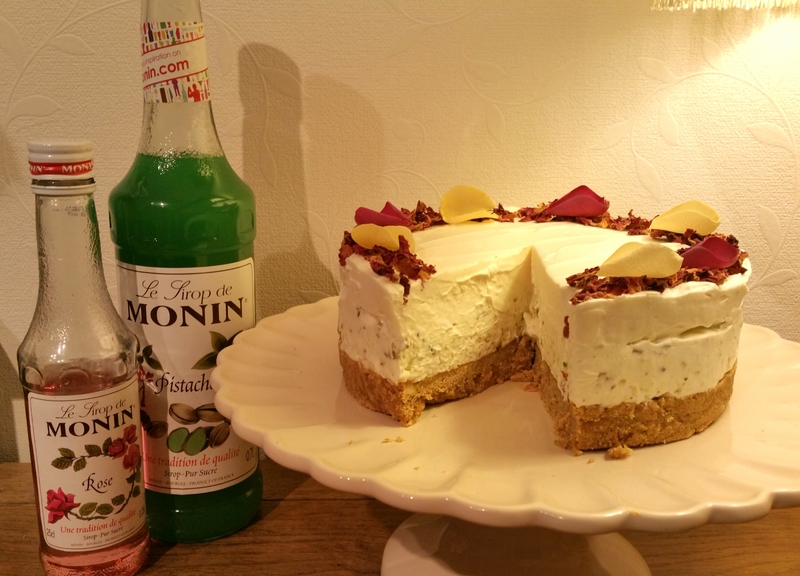 The lovely people at Monin UK asked me if I would like to come up with a recipe suitable for this romantic day, and I immediately knew what I would make. People often say that oysters are the food of love. Well they’re wrong. It’s cheesecake! Fluffy, creamy, indulgent cheesecake. Not the baked ones either. You just can’t beat a no-bake cheesecake. And if you’re going to make something so heavenly, you don’t want to settle for a thin, easily crumbled base and an inch of cheesecake topping, oh no! You need a thick base you can taste, and you need lashings of creamy topping. If this looks too much for you, you can just half the ingredients to make a more delicate version, but I’d recommend going the whole hog and trying it this way. Or you could just use a bigger tin than I used. As you all know by now, rose is my absolute favourite flavour and perfect for Valentine’s day. Don’t give someone a single red rose. That’s too cliché! 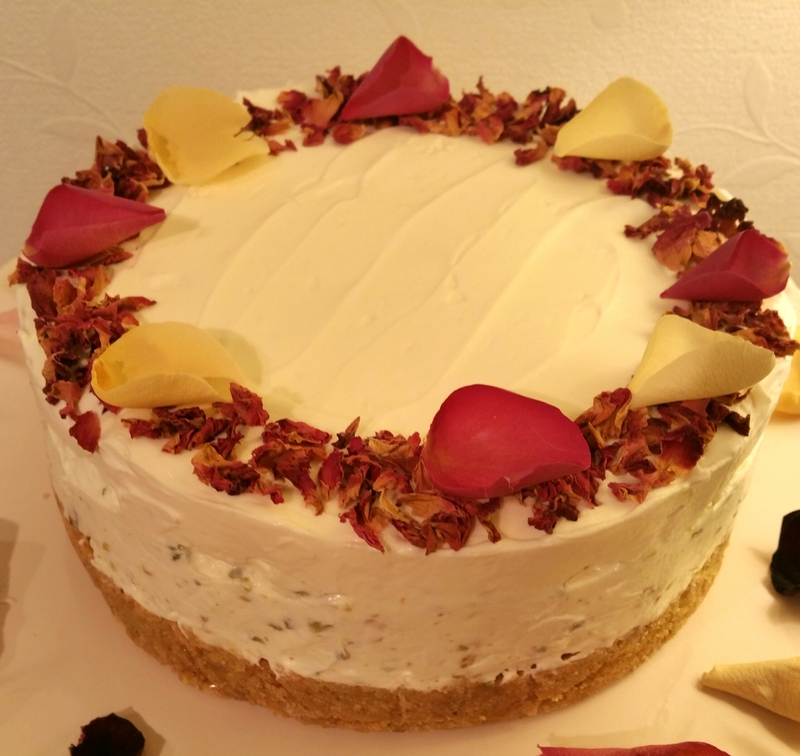 Make them a beautiful rose cheesecake instead. Decorate it with rose petals, and you’ve just won my heart 🙂 I didn’t just want rose on its own though. I wanted another delicate taste, and pistachio pairs beautifully with rose. 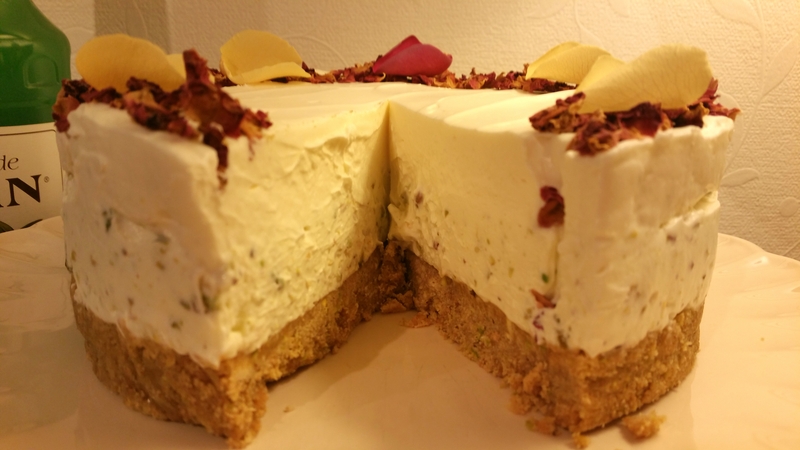 I’ve included pistachio nuts in the base and the topping but you can leave them out if you want. The pistachio syrup flavour is gorgeous. I only added the actual nuts for a bit of yummy texture. You could make this cheesecake using different flavoured syrups if you prefer but be careful if you do… not all are suitable as some of the more sour ones (such as pomegranate and cranberry) can curdle the mixture. I was toying with the idea of delicately colouring the layers (green for the pistachio and pink for the rose) but decided that if you accidentally add too much you’ll be left with a very garish looking dessert. So I’ve kept it simple this time, but feel free to colour the layers gradually if you want. To Make the Base: line a 7 inch loose-bottomed deep cake tin or springform cake tin with foil, carefully making sure you press as many bumps out as possible. Gently melt the butter in a saucepan, making sure it doesn’t burn. Blitz the biscuits and pistachios in a food processor until they become crumbs. Alternatively, place them into a ziplock bag, and bash them with a rolling pin. Pour the crumb mixture into the pan with the butter and mix until well combined. Tip this mixture into the cake tin, cover the bottom completely, and then use the back of a spoon to press the mixture down firmly. Place into the fridge for at least 1 hour to firm up. To Make the Topping: Place the cream cheese into a large bowl, or the bowl of a stand mixer, and gently whisk it to loosen it up a bit. Add the sifted icing sugar and whisk until combined. In another bowl, whip the double cream until it reaches soft peak stage. (When you lift the beater or whisk, the cream will form a slight peak but the tip of it will fold back down). Add the cream to the cream cheese mixture and fold in with a spatula until well combined. Place half of this mixture into another bowl (or back in the bowl you whipped the cream in to save dishes). Place the pistachio nuts into a food processor and blitz until roughly chopped. Alternatively chop by hand with a sharp knife. Tip these into one of the bowls of cheesecake mixture, along with the pistachio syrup. Fold in well with a spatula until completely combined. You’ll notice it thickening as you fold it. Pour this on top of the cheesecake biscuit base, and smooth it down until level. Place into the fridge until the next part is ready to use. Pour the rose syrup into the bowl with the remaining cheesecake mixture and fold in well with a spatula. Again, you’ll notice it thickening. Remove the cheesecake from the fridge and gently spoon this layer on top. Spread until it has covered the first layer and is smooth and level. Place back into the fridge for at least 5 hours to set (overnight would be perfect). Remove from the fridge. Gently remove from the tin and peel off the foil very carefully. It should hold it’s shape easily by now. Place onto a serving plate and scatter rose petals around the top. Serve and enjoy! I used a range of large and small petals but you can use whichever you prefer. Or you can use pistachios or even chocolate curls if you prefer. Although I made this with Valentine’s Day in mind, it is perfect for any occasion really. I’d recommend buying Monin Syrups either from Udal Supplies Ltd or from Next Day Coffee. Just click on their names to go straight to their websites.